The Thai consumer confidence index in September 2017 increased for two consecutive months due to a recovering economy. Export and tourism growth were the main factors contributing to the expanding economy. The University of the Thai Chamber of Commerce (UTCC) has unveiled a new center to support entrepreneurs and ultimately boost economic growth. PRIME MINISTER General Prayut Chan-o-cha has told the Thai community during his visit to the United States that the election should take place in 2019, many months later than the junta-appointed legislators had predicted. Kasikorn Research Centre has revised upwards its forecast for the nation’s GDP growth this year to 3.7 per cent from the previous projection of 3.4 per cent. The general election is now likely to be held in May 2019 at the latest, according to a new timeline confirmed by the president of the National Legislative Assembly (NLA). Thailand’s Amata Corporation Pcl and Sweden’s Saab AB expect to jointly build an aerospace parts plant and a pilot training centre in Thailand next year to tap growing demand in the region, Amata’s chief said on Thursday. Thai Beverage’s (ThaiBev) sales in the nine months to Sept. 30 dropped 6 percent year on year to 142 billion baht ($4.3 billion) because of slow economic growth, CEO Thapana Sirivadhanabhakdi told reporters on Thursday. The KTD Property Development Company has decided to cancel its plan to build a non-alcoholic drink factory in Khon Kaen’s Ubonrat district and may move its factory to a neighbouring country. Thailand’s Minister of Industry has delivered policies to the Department of Industrial Works (DIW) to accelerate development of its agencies for industry 4.0. 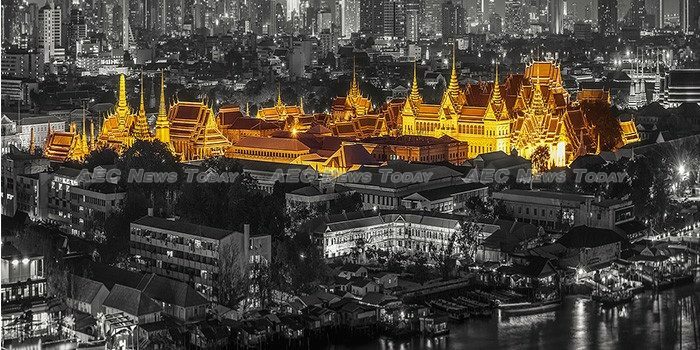 Bangkok has confirmed its position as one of the world’s favourite holiday destinations, taking the top spot in the just-released Mastercard Global Destination Cities Index 2017. One government development policy is to provide access to the Internet in rural areas, in order for residents to use the technology to improve their daily operations. To find out more about this campaign, which is known as Netpracharat, we join Na-ark Rojanasuvan. Five men have been arrested for allegedly robbing 196 million yen or 60 million baht in cash belonging to a jewelry trader at the parking lot of a Ratchadipisek condominium on Tuesday. POLICE HAVE arrested five suspects over the robbery of 197.96 million yen (Bt60 million) from employees of a Bangkok jewellery exporter and recovered all of the stolen cash. Thailand’s Ministry of Tourism and Sports has set up a joint administration center, involving both the public and private sectors, to provide adequate accommodation for tourists during His Majesty the late King Bhumibol Adulyadej’s royal cremation ceremonies, to be held from Oct 25-29, 2017. American-Japanese convenience store chain, 7-Eleven, which is fast replacing small family-owned stores nationwide, is not breaking the law by offering beer on tap as long as it is poured by cashiers rather than customers, DDC deputy director Asadang Ruayajin said this week. Advanced Info Service (AIS) will offer Apple’s latest products starting on November 3, including the new generation iPhone 8 and iPhone 8 Plus, at AIS and authorized Telewiz shops, iStudio, and AIS online. The Sustainable Rice Platform (SRP) is holding the 2017 Sustainable Rice Conference and Exhibition, which started YESTERDAY and will conclude TODAY, at the United Nations Convention Centre (UNCC) in Bangkok. The Ministry of Energy has introduced a new project to promote electric tuk-tuks as a part of the country’s energy conservation plan. Almost 12 million people, or almost one sixth of Thailand’s population, have visited the glittering Grand Palace in Bangkok to pay their respects to the late King Bhumibol Adulyadej since he died last October, the palace said on Thursday. The government is taking steps to move Thailand’s status up from a current Tier 2 on the U.S. Trafficking In Persons (TIP) report by next year. A Thai criminal court has issued a second arrest warrant for former prime minister Yingluck Shinawatra, who fled the country weeks ago before she was sentenced to jail in absentia, police said on Thursday. The Harbour Department has imposed navigational controls on vessels operating in the Chao Phraya river, Klong Mon, Klong Bangkok Noi and Klong Bangkok Yai on October 6, 9 and 17 during which activities related to the Royal cremation ceremony are to be held. A chemistry lecturer at Kasetsart University has expressed concern that the hydrogen sulfide in the untreated wastewater discharged into the environment by an ethanol production factory in Suphan Buri province may contaminate soil in affected areas to the extent that farming will not be possible. A weak La Nina pattern, possibly affecting weather and rainfall over large parts of the world, may develop and cool the Pacific Ocean in the final quarter of this year, the World Meteorological Organization (WMO) said on Thursday.